Re: Post Pictures of Your Astrophotography Imaging Setup! 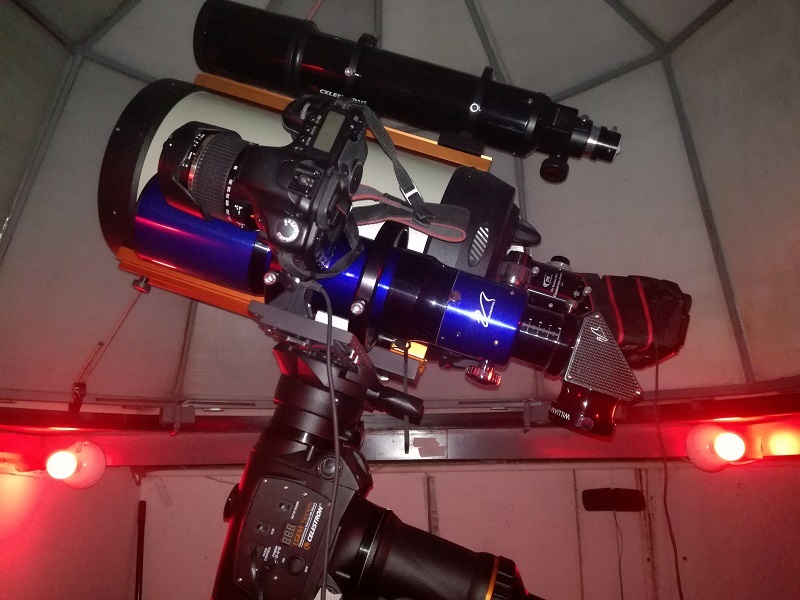 Here is an update on my astrophotography setup. Ghostryderflyby, j.gardavsky, BABOafrica and 17 others like this. Finder Sight, ES 11, 6.7 mm eyepieces, Feathertouch Micro Focuser, Moonlite focuser, ADM knobs, Celestron SkyScout, Celestron 20x80 binos, JMI heavy duty Wheeley Bar with 10" tires. This is one extreme to the other here to compare my ramshackle setup to pbishop's! However, it is what it is and it does the job. An SW 80 ED on an AVX with NexGuide autoguider on basic 80 mm f 7.5 guide scope. Canon XS (modified) on flip mirror . Battery box underneath with 2 x 12 vdc for AVX and dew heater and 6 vdc for Nexguide. Behind is a Celestron Power Tank looking after the camera power. NOTE! There is not a laptop in sight! Totally self-sufficient out there. Jerry Sykes, Peppy2, frant and 3 others like this. Might be worth inserting a pair of four inch M3 rods or tubing inside the braid sleeves at the connector ends and using some shrink tube to close the gaps, that would take any pressure off the connectors. Did you make the external panels? I think he is the Doctor and that is the new Tardis. My scope setup, I just love it! Every day I learn something new and I do have a LONG way to go! This hobby it worths it! many enjoyable hours of fun, learning, distraction and peace! KathyNS, Peppy2, bladekeeper and 1 others like this.